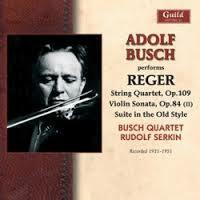 Adolf Busch was a close friend and important advocate of Max Reger, so it is frustrating how little of Reger’s music Busch recorded. But it is all included on this disc, and it makes for fascinating listening. The String Quartet No. 4, op. 109, with the Busch Quartet, is the main offering, but we also have the Suite in Old Style, op. 93, and a movement of the Fifth Violin Sonata, op. 84, both accompanied by Rudolf Serkin, another important Reger advocate in the decades following the composer’s death. The personal connection between violinist and composer suggests that these recordings may offer an insight into how Reger himself expected his music to be played. But the issue is complex. Reger wrote the sort of expressive, late Romantic music that requires deep, personal expression in performance. Yet the composer himself, seemingly untrusting of his interpreters, wrote highly detailed performance directions, so detailed, in fact, that the differences between one performance and another usually come down to which of the dynamics, articulations, or tempo changes one or other performer has chosen to ignore. From that perspective, the most significant aspect of the Busch Quartet’s reading of op. 109 is their fidelity to the score’s directions. This is particularly notable with the tempo changes: Reger gives a rit. at the end of almost every phrase, followed by a tempo or a new tempo at the start of the next, so the fidelity of the Busch Quartet never risks monotony. They sometimes feel a little restrained, though, and on these occasions it is a question of degree. An ascending crescendo figure appears several times in the Larghetto third movement, the first time at bar 23, with the direction quasi un poco più mosso. This figure sounds quite stately here, but in modern recordings it really takes off, though the unusual reticence of the performance direction gives scope for both approaches. The other major difference between this and more recent recordings (Philharmonia Quartet Berlin, Naxos 8.554510; Vogler Quartet, Nimbus 5644; Mannheim Quartet, MDG 3360713) is the slower tempos. Again, Reger gives license here, with a metronome range indicated for each movement. Movements are almost always longer than in modern recordings, though in the first, second, and fourth usually only by seconds. The Larghetto, however, at 12:43, is minutes longer, creating a completely different effect. Again, the Busch Quartet seems to be following the letter of the score, and their tempo is within the eighth note=52–56 prescribed. But they have some trouble maintaining the tone in the long phrases at this speed, and Reger’s always indicated rits at the ends of phrases are often accompanied by a falling away of tone. Modern performances create a greater sense of unity here through faster tempos, and more sense of shape through emphasizing those quasi un poco più mosso outbursts. The Suite in Old Style is more successful. “Old Style” here refers more to the forms than the aesthetic, with Bachian counterpoint underpinning high Romantic textures. Busch and Serkin are in their element, and the violinist’s rich tone in the lower register is particularly satisfying in the Fugue finale. Surprisingly, this work has had few modern recordings, with usually only the Largo second movement appearing on recital discs. The only other complete recording currently available seems to be the one from Szymon Krzeszowiec and Niklas Sivelov on DUX 0840, although Reger’s later orchestral version is more popular on disc. Two “bonus tracks” are included, from the Wendling Quartet. Karl Wendling was a violinist of the generation before Busch and another close associate of Reger. He was the dedicatee of Reger’s Clarinet Quintet, making this recording of the work’s second movement historically significant. In fact, it is not a very exciting reading. It seems more austere than on more recent recordings, although this is probably due to the 1929 sound obstructing the clarinet tone (generally, though, the sound quality on these transfers is excellent for their age). More interesting is the Wendling Quartet recording of the second movement of the op. 109 Quartet, recorded 17 years earlier than the Busch Quartet version. Technically, it is superior, and the comparison highlights some shaky intonation from Adolf Busch and some suspect ensemble from his colleagues. But the Wendling Quartet takes liberties with the score that Busch would never dream of, holding accented notes for greater emphasis and applying tempo changes where none are marked, most notably with the pizzicato cello bass line before figure 10, which is taken much slower. The op. 109 String Quartet is well served today by several fine recordings (the Mannheim Quartet’s MDG version is the pick of them), but they generally present a consensus on interpretive matters that clearly had yet to be reached in the early part of the 20th century. Even by the Goeyvaerts String Trio’s standards these are uncompromising works. Their previous releases have focused on string trios by the Second Viennese School and by religious minimalist composers, and their interpretations have emphasized focus and intensity. Both Górecki and Korndorf benefit from this approach: there is nothing decorative about either of their scores presented here, and the interpretation really feels like it is getting to the heart of the music. It is not an easy ride, but the Goeyvaerts ensure it is a rewarding journey. Górecki’s Elementi dates from 1962, early in his career and well before the minimalism that later made his name. The style is sonoristic, relying on tone colours produced through extended performance techniques. The score (of which a page is reproduced in the liner) occasionally specifies pitches, but not rhythms – dynamics and performance directions being of far greater importance here. This is the second commercial recording of the work, the first was made by the Silesian Quartet, probably under the composer’s supervision, but is not (I don’t think) currently available. I haven’t heard that version, but I understand, from Adrian Thomas, that the timings of this new version are closer to those specified in the score. Thomas also says that the earlier version has a ‘fierceness’ and ‘white-hot passion’, which he suggests are absent here. I think I can hear what he means, particularly in the control that the three players exercise over their sound in the new recording. The way that long glissandos are evenly paced and continuously supported, the careful gradation between different dynamic levels (even when approaching the extremes), and the care taken over balance between the parts – these are all Goeyvaerts Trio trademarks, and, to my ears, they are all benefits. It’s not the only way to play the piece, seemingly, but it’s certainly a compelling one. As an added benefit, this new version is recorded in surround sound, with the players positioned in a large triangle formation as the score stipulates. A sense of that spatial arrangement is retained, even when listening in two-channel SACD, and the exceptional sound quality too is a real benefit, especially in music like this that relies so heavily on nuances of timbre. The Korndorf String Trio was written in honour of Alfred Schnittke, but finding actual links to Schnittke’s music in it is surprisingly difficult. Korndorf related that Schnittke’s influence went deeper than mere style, and that the older composer brought a new philosophy to late Soviet Russian music. Korndorf honours that philosophy with music that shares Schnittke’s spiritual outlook, at once modern and archaic, its style heavily influenced by medieval chant and polyphony. Schnittke’s name also appears as musical monogram, as it often does in Schnittke’s own music (hence the initials in the title). But, by 1986, when the work was written, Korndorf was some years into a style of austere minimalism, little connected with Schnittke’s music. The result is a three movement work, two slow movements surrounding a fast central section. Scordatura is used to bring the open strings of the three instruments as close as possible to the arpeggio of D Major, which is held for long stretches of the first movement. The central movement runs in continuous semiquaver figurations, initially passed between the instruments, but as the movement goes on, increasingly performed by them together in rhythmic unison. An interesting quality of this new recording is the way that the fast central movement feels like it is unfolding at the same slow pace as the outer ones. The semiquavers are executed with such regularity, and the broad phrase shapes articulated with such clarity, especially the long hairpins, that the underlying structure becomes as prominent as the surface. As in the Górecki, the whole work here is presented with exceptional clarity of tone, balance of ensemble, and precision of intonation. This too is the second commercial recording, the first, which was released on Megadisc in 2002 (MDC 7804) features the impressive lineup of (a then very young) Patricia Kopatchinskaja, Daniel Raskin and Alexander Ivashkin. Again, there are virtues to both recordings, but in this case the new version is clearly superior. Kopatchinskaja’s folk-inflected playing suits much new music of Eastern Europe (I’m thinking of Ligeti in particular, but much else besides), but Korndorf calls for something else. He gets it here, in the greater purity of tone from all three players and that sense of focused intensity over the music’s long spans. The liner notes are interesting and erudite – they’re by me. Actually, there is a lot of new material there about the Korndorf, based on conversations I had with the Trio’s cellist, Pieter Stas, who had put much work into deciphering the score in terms of the proportional structuring and the covert references to Schnittke, all of which I discuss. As mentioned above, the sound quality is also a major bonus, and the Korndorf benefits as much as the Górecki from the clear, involving sound – the Trio seems to sit around you, and it is easy to get subsumed into the sound, especially all those open-string D Major chords in the Korndorf. 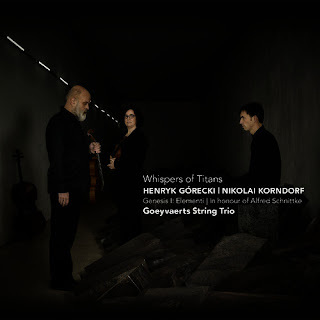 A typically adventurous project then from the Goeyvaerts String Trio, and one that gives welcome exposure, and excellent performances, to two challenging but unjustly neglected works.